Europe is going strong….are you? | BURDICK PSYCHOLOGICAL & PLACEMENT SERVICES, INTL. Europe is going strong….are you? The Irish have a saying “Go hÉirinn le frown agus saoire le gáire.” I’m not sure what it means but I feel better already. 500 school partners and growing. Seen here is one of these partners, DIT, and I’m their agent in bringing great candidates to attend a college that is affordable and well established — now well over 150 years old as an school offering a wide range of vocational and certification in various courses. I’m confident I can provide you with an option that is both affordable and unique whether it be an undergraduate in music technology or a master’s degree in a sought after field of study. 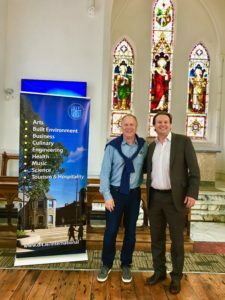 Ireland provides unique opportunities and we’d love to share more!